Accidents involving pedestrians occur every day in the United States. The National Highway Traffic Safety Association reports that around 5,000 pedestrians die each year in motor vehicle related crashes. Furthermore, each year close to 80,000 pedestrians suffer injuries after being struck by some type of motor vehicle. Drivers behind the wheel can also suffer injuries after hitting a pedestrian depending on what type of accident and how serious it was. Pedestrians can also suffer injuries due to other types of threats such as walking near or under construction sites, debris in the road or on the sidewalk, defects in the road or sidewalk, or poor property maintenance. In Maryland, the Law Offices of Foran and Foran, P.A. can represent you or your loved one, if as a pedestrian, you have been injured in an accident involving a vehicle such as a car, SUV, truck, or motorcycle. The results from pedestrian- involved accidents can be life changing and sometimes tragic. It is important to be represented by an attorney who is knowledgeable and understands what needs to be done in order properly compensate the plaintiff. As with any accident, it is very important to have your attorney involved as early as possible after the accident occurs. A pedestrian is someone who walks on the road, the sidewalk, or crosses the street. As with every mode of travel, walking does present some risks. On the other hand, walking can also be a healthy and beneficial mode of transportation as long as drivers and pedestrians are adhering to the laws of the road and everyone is paying attention. If a pedestrian is struck by a moving vehicle, he or she may suffer serious injuries, or even death. In some pedestrian accidents, the driver operated the vehicle in a reckless or negligent manner, which caused the pedestrian accident. In other cases, the driver or the pedestrian may have been under the influence of drugs or alcohol, or the driver may have been speeding. Also, the driver may not have been qualified to be operating a vehicle at all, such as an elderly person whose license expired or someone driving without a license at all. Regardless of the situation, if you were injured in an accident and you were the pedestrian, the Law Offices of Foran and Foran, P.A. are here to assist you. We represent clients that live and work in Chillum, Fort Washington, Oxon Hill, Landover, Suitland, New Carrollton, Beltsville, Laurel, Bowie, College Park, Upper Marlboro, Greenbelt, Captiol Heights, Hyattsville, Forestville and Clinton. In any pedestrian accident, the fault is determined by the “duty of care” of each party involved. Anyone who is on the road, whether walking or driving, must follow the rules of the road, and they must be reasonably careful while driving or walking. Examples of a negligent driver or someone who has not exercised “reasonable care under the circumstances” include but are not limited to: failure to follow the speed limit, disobeying traffic signals or traffic signs, failure to yield to pedestrians at designated crosswalks, driving under the influence of alcohol or drugs, or simply not paying attention. Also, property owners can be considered at fault if there is something wrong with their property which led to a pedestrian being injured while walking on their property. It is important for property owners to maintain their land in a safe manner, whether it be the walkway in front of the house, the driveway, or the lawn. Furthermore, laws in Maryland indicate a higher duty of care with regards to children as pedestrians. Because children are smaller and more difficult to see, it is very important that drivers take extra precautions while driving in areas where children are likely to be. At times a child’s behavior and movement is unpredictable which makes children more at risk of being hit by a moving vehicle. Children under the age of 10 are at the greatest risk of being hit by a driver. While driving near schools and in residential neighborhoods where children are known to play, there are usually traffic signs posting lower speed limits and pictures of children playing in order to remind drivers to be extra careful while driving in those areas. Any time a child is in close proximity to a moving vehicle, either in a large city where children are walking near their parents on the sidewalk or in a small parking lot or parking garage, it is imperative for drivers to slow down and pay attention. Pedestrians also need to exercise “duty of care” to ensure their own safety. 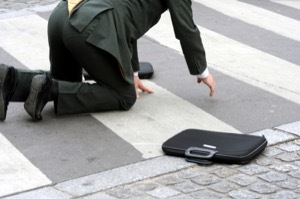 A pedestrian could be considered negligent if he or she failed to exercise such care. Examples of possible pedestrian negligence, depending upon the circumstances, are: ignoring the “walk signal” at an intersection or crosswalk, or walking when you are not supposed to and disrupting the flow of traffic, walking across the street in an area that is not a designated crosswalk, or knowingly walking in an area that is labeled a “construction zone” with debris or other dangerous items that would put a pedestrian at risk. Depending upon circumstances, pedestrians may put themselves, as well as drivers, at risk of causing an accident because they create a situation where a driver is not as prepared to stop quickly to avoid hitting a pedestrian or another vehicle. Although the number of pedestrian-involved accidents have decreased over the last decade, there is no accurate way to determine exactly how many pedestrian accidents occur each year because a lot of the accidents are never reported by police. In addition, there is no accurate way of determining how many people are walking each day, for how long are they walking, and whether they were involved in even minor accidents. Law enforcement officers, emergency medical personnel, and construction workers are all considered pedestrians at times due to the nature of their jobs, and they are considered to be at risk while working alongside the road near moving vehicles. Drivers are supposed to slow down any time that they are driving near construction sites, or somewhere that a police officer or emergency medical professional is working on the side of the road due to an accident or other type of emergency situation. In some instances, near schools, churches, hospitals, or in major cities, some law enforcement officers stand in crosswalks in order to help slow drivers down or stop which gives pedestrians time to get across. Finally, there are some important things to consider if you are ever involved in an accident. First and most important, you should call emergency medical professionals and the police so that you can receive the appropriate medical attention that you need in case you are injured (call 911). You also might not realize how hurt you really are until days after the accident actually occurred. After you call the police, you should keep detailed documentation of exactly what happened, the extent of the damages, as well as any injuries. You should also obtain any information you can about other people involved in the accident, such as names, license plate, car description, phone numbers, insurance companies, and the situation surrounding the accident or what may have caused the accident to occur. You should try to contact any witnesses that may have seen the accident take place, and obtain their information as well. You should avoid speaking with insurance companies until after you speak with an attorney. It is very important that you speak with your attorney first so that your statements are accurate, and to ensure that an insurance agent does not take advantage of you over the phone and ask you to say something that you did not necessarily mean and/or ask you questions that you are not prepared to answer. Being involved in an accident can impact a person in many ways. Whether you are emotionally impacted or physically injured from an accident, you are entitled to a good attorney who will help you get what you deserve and assist you in dealing with the insurance companies. The attorneys at Foran and Foran P.A. are an excellent choice for this type of case, and they are experienced in helping plaintiffs who have been involved in pedestrian-related accidents. Keep in mind that the Law Offices of Foran and Foran, P.A. represents the plaintiffs, or the victims who are not to blame for causing any part of the accident, but we do not represent those who are responsible for causing the accident. The Law Offices of Foran and Foran, P.A. are based out of Greenbelt, MD in Prince Georges County, conveniently located just off of the beltway. We have more than 60 years of combined experience in cases involving accidents, and we have represented many pedestrians. Our office is located near major cities such as Chillum, Fort Washington, Oxon Hill, Landover, Suitland, New Carrollton, Beltsville, Laurel, Bowie, College Park, Upper Marlboro, Greenbelt, Captiol Heights, Hyattsville, Forestville and Clinton. Call our offices at 301-441-2022 to see how we can help you. We are confident you will be so glad that you did. In Maryland and the District of Columbia , the law requires a pedestrian to use ordinary care in crossing a street. Crossing at a crosswalk is the optimum situation for a Plaintiff in order to proceed with a lawsuit arising out of damages incurred while being struck as a pedestrian. Both a driver of a motor vehicle and the pedestrian have an obligation to maintain a proper lookout for danger. Each must make reasonable observations about what is possible to be seen. There is case law that even allows a pedestrian to prevail if he or she is not crossing at a crosswalk but the case does become more difficult, although not impossible under certain circumstances. The law requires a person trying to cross railroad tracks to stop, look and listen for an oncoming train. A reciprocal duty is imposed on the operator of the train to exercise reasonable care under the circumstances as well. In some jurisdictions such as Maryland , the duty to a pedestrian who is merely walking along railroad property may be less than if the pedestrian was just crossing the track to get from one place or another. An experienced personal injury attorney can help you determine if you are able to successfully pursue a claim against a railroad company or train operator.